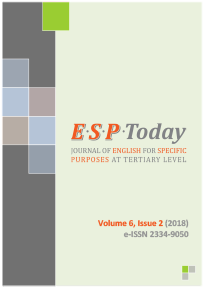 ESP Today - Journal of English for Specific Purposes at Tertiary Level is an online-only open access peer-reviewed journal dedicated to publishing high-quality research papers covering all areas of English for Specific Purposes in the context of tertiary education. The Journal is aimed at ESP researchers, scholars and practitioners worldwide. ESP Today is published by the joint efforts of the Faculty of Economics, University of Belgrade, the main publisher, the Faculty of Philology, the Faculty of Transport and Traffic Engineering, University of Belgrade, and the Serbian Association for the Study of English (SASE). ESP Today comes out biannually and welcomes submissions of previously unpublished research papers on a variety of topics taking a broadly defined tertiary-level ESP perspective. We invite you to submit a paper related to your research interest in the field of ESP at tertiary level and contribute not only to high quality of ESP Today and its recognition within the international ESP community, but also to the academic exchange of views which will make this journal a forum for further ESP upgrading.